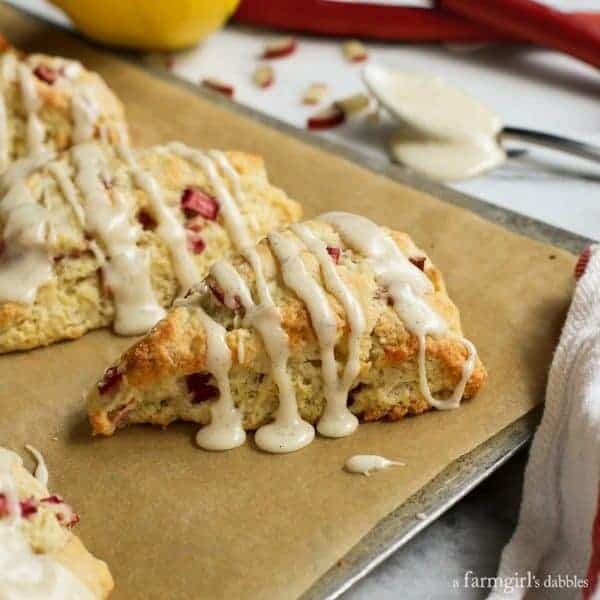 These Lemon Rhubarb Scones with Vanilla Bean Glaze are springtime pastry perfection! Rhubarb season is starting to wane here in the Midwest and I’m grabbing every opportunity I can find to celebrate it, in all its tart glory. This past weekend, when my sister’s family stayed with us, I mixed up rhubarb mojitos for us to sip alongside the fire in the back yard. Those ice cold bevvies were a hit with us adults, for sure. And watching the kids’ water gun war, full of sneaky tactic and laughter, was the finest summer entertainment. We’re also loving the baking that goes along with the rhubarb of springtime. I still have on my agenda, when I can get my hands on some fresh local strawberries, to bake a strawberry rhubarb crisp. When served warm, with scoops of cold vanilla ice cream, it’s extremely hard to resist. 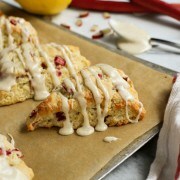 Just like these beautiful Lemon Rhubarb Scones with Vanilla Bean Glaze. Until the rhubarb runs out, we can’t stop. We won’t stop! 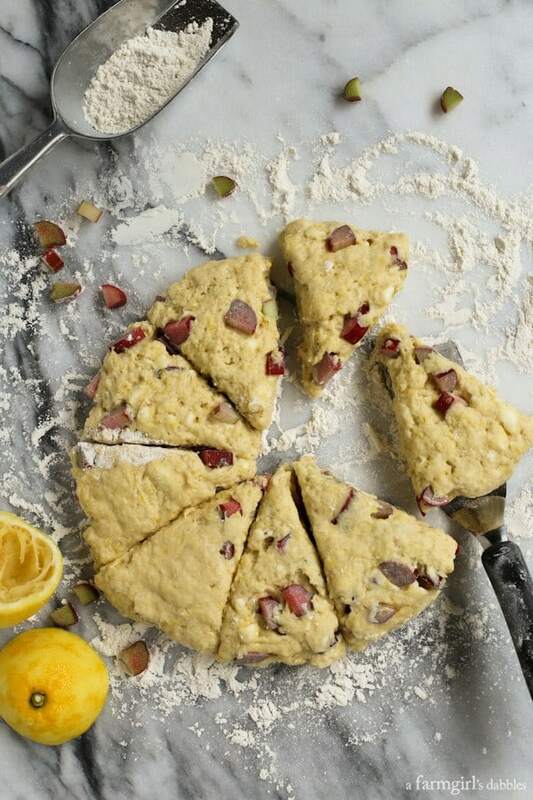 This lemon rhubarb scones concept has been on my mind for a few months, a baking project for the blog. 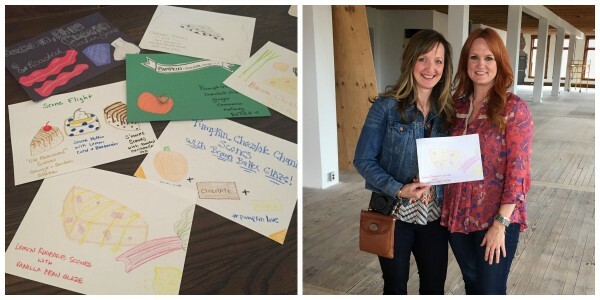 But my idea was brought out of the closet when I entered it in a scones design contest while visiting The Pioneer Woman‘s ranch with Land O’Lakes last month. And my scones idea was chosen by Ree as one of the scones that will be featured at The Building‘s coffee shop. Coolio, huh? I am truly honored. And I canNOT wait to visit Ree’s mercantile store and enjoy a cup of coffee and a scone! Many of you have asked for this recipe. So I’ve been workin’ on it, still determined to fulfill my recipe to-do list. You’ll find it below. And if you want to learn more about the time we spent at The Ranch, just go here and here. 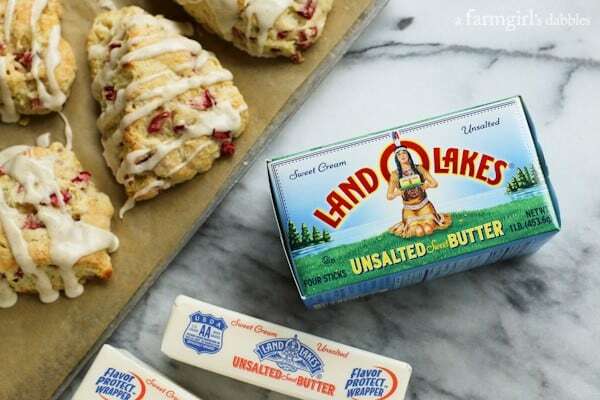 Of course, my scones recipe has Land O’Lakes butter at its heart. Cold butter is cut into the dry ingredients, lending pockets of delicious, buttery flakiness when the heat hits it in the oven. There are many ways to shape a scone. But the method I return to most often is the pie-shaped one. I simply pat out the finished dough into a smallish-sized circle, cut it into wedges, and transfer the triangular shapes to a baking sheet lined with parchment paper. Once the lemon rhubarb scones have cooled a bit, I whisk up a simple vanilla bean glaze and drizzle it over the top of each piece of pastry. These scones are moist on the inside, with a delicate, crispy exterior. No dry, hockey puck scones are allowed out of our kitchen! Bright with lemon and tart with bits of ruby rhubarb, the scones are sweetened with the loveliest vanilla glaze. If there’s ever a way to punch up the flavor and beauty of vanilla’s subtlety, scraping some fresh vanilla beans into the recipe is a sure bet. Quick, before rhubarb season departs, make these scones. I’d love to know what you think of them! In a medium bowl, stir together flour, baking powder, baking soda, salt, sugar, and lemon zest, breaking up any clumps of lemon zest. With a rigid pastry blender or two knives, cut in butter until mixture resembles coarse meal. Make a well in the center, and then add buttermilk, lemon juice, vanilla, and egg. Stir just until combined, taking care to not over mix. Gently fold in rhubarb, just until barely combined. Transfer dough to a lightly floured work surface and gently knead 2 or 3 times to bring it all together. Pat dough into a 7” diameter circle and cut into 8 wedges. Transfer wedges to prepared baking sheet. Bake until scones are puffed and golden brown, 12 to 14 minutes. Remove pan from oven and let scones sit on baking sheet for a couple minutes before removing to a wire rack. While scones are still slightly warm, prepare the glaze. In a small bowl, whisk together all glaze ingredients until smooth. If the glaze is a bit stiff, add another teaspoon of vanilla extract or half and half. 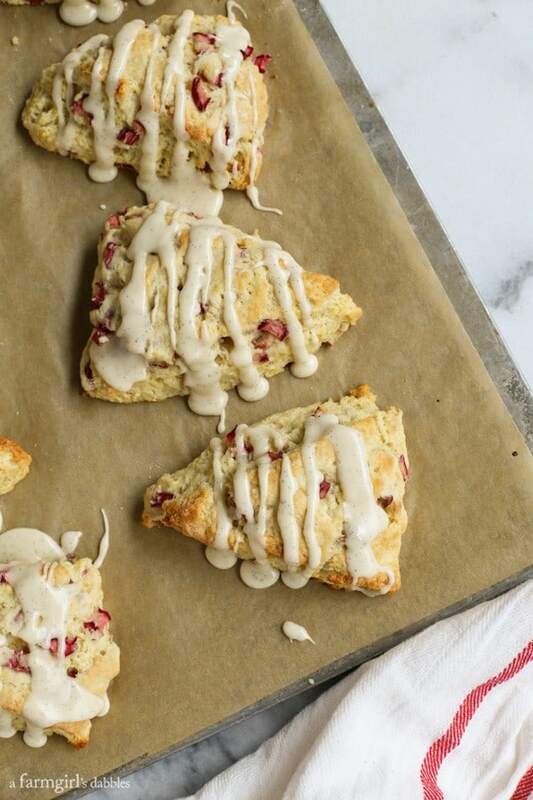 Drizzle the vanilla bean glaze over the scones using a spoon. Allow icing to set completely, then serve. Scones are best eaten on the day they are baked. To revive leftover scones’ flaky texture the following day, preheat a cooking stone to 300° in the oven. Place any number of scones on the stone and warm for 5 minutes. I made this with some changes. They are light and fluffy. I used sprouted wheat flour and Sugar in the Raw sprinkle on top. They are fantastic!! I also used a food processor. The dough was so light and had wonderful feel that to me means they will be good. 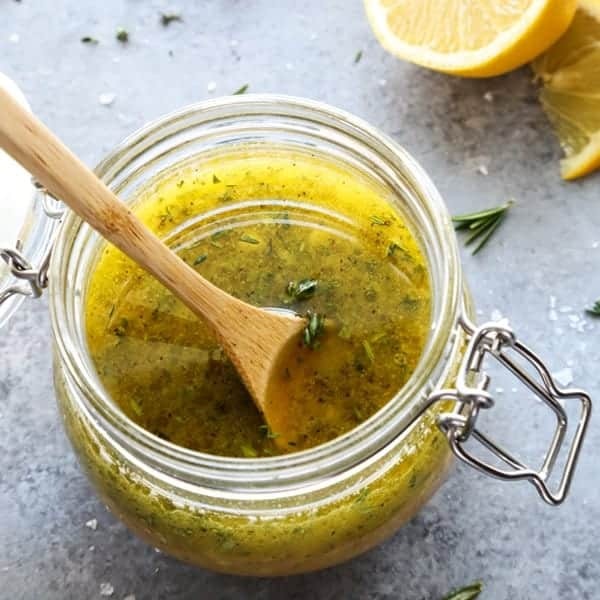 This one of the few recipes that uses less sugar. Has anyone used maple syrup? Wonderful!! So glad you liked these scones! Thank you so much for this recipe!!! i made 3 batches of these this weekend with regular flour, and 1 batch with gluten free flour. They were amazing!!! Rave reviews from everyone. Everyone asked for the recipe. We love rhubarb and finding great recipes is always rewarding. I added white chocolate chips to the recipe, however. Since there is not a lot of sugar in the recipe, the chips added a touch of sweetness with the rhubarb. it was approximately 1/2 cup per recipe. Thank you again!! I made these last night and they were great!!! I so loved having a new recipe to use with rhubarb. Thanks! So happy to know you liked these, Jessica. Thank you! Here in Minnesota the rhubarb is still available in some gardens, including my friend’s. I won’t need much for a double batch of your lovely scones. I bake every Monday for a meeting I attend….been doing it for 8 or 9 years now. I’m always looking for something different from the usual pies, cakes and bars. Never thought of scones. Thanks for the recipe and the beautiful photos. Thank you so much. I hope you liked these! I made these Saturday for Father’s Day breakfast, but since it’s just the two of us anymore, I made them and immediately stuck them in the freezer before baking them (this was Saturday). On Sunday, I pulled two of them out, plopped them on parchment paper on a baking sheet and baked them. Perfect. My daughter, who blogs at Stephie Cooks, and I have done this before, and it works great. Thanks for the recipe. We loved it! (And we get to have a few more breakfasts with the leftover scones. I’m pretty sure we win!). Excellent! So glad you liked these! 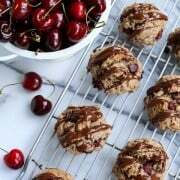 These scones look and sound delicious! I love Rhubarb! I love it so much I eat it right off the plant. Growing up I can still remember mom yelling out the window “don’t eat the leaves, they’ll kill you”, so I did the same to my kids. I never thought of making scones with the rhubarb, Going to have to make these now. Congratulations on winning the contest and for them being feature at Ree’s Building in the coffee shop! I would give my right arm to be able to there at the building to sip on coffee and eat one of your scones! lol! Great story, Donna! :) Thanks for sharing and for the congrats. I hope you make yourself some rhubarb scones soon! These scones look just perfect! I love the rhubarb – I think I need more rhubarb in my life! Oh Brenda, these look amazing! Pinning to my breakfast board… I love a good scone. That’s so great that these scones will be featured at The Building’s coffee shop! I wish I had one to go with my coffee now! Look at those lofty scones! This is a must for my rhubarb crazed family! yummy …. going to make this afternoon … do you mean the little seeds that are in the vanilla bean ???? 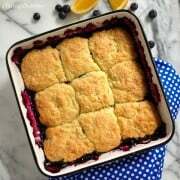 Your photos are absolutely stunning and the scones sound so refreshing for summer! I can see why Ree picked them! These look amazing and with butter and rhubarb at the heart they are sure to taste great too! These scones look perfect! I love rhubarb too and can’t get enough of it this time of year. Congrats on winning the competition! 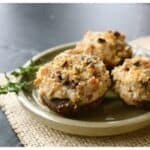 Made these last night – perfect!! That is SO AWESOME that your scones will be on the menu at The Building’s coffee shop! Congrats! Now all I want to do is go to there and eat these scones all day long. These are picture perfect in every way. And so excited that they will be featured in The Building!! Congrats on these lovely scone being selected! They look and sound so good. 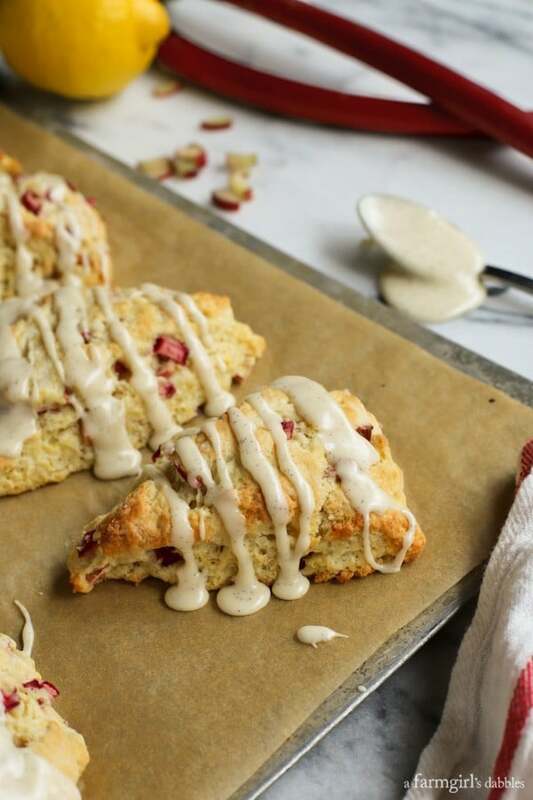 Can you use frozen rhubarb in these scones by chance? My friend gave me some a while back now and I froze a big old bag of it all cut up already. I really prefer to always use fresh rhubarb, unless it’s a coffee cake or a pan of strawberry rhubarb crisp. But if you do give it a try in these scones, please let me know how it goes for you. Thanks! I am so jealous that you go to meet Ree!! Also, these scones are to die for. Totally pinning! I bake for a local high end coffee shop. Rhubarb is in season and my rhubarb scones sell so quickly! But i hadn’t thought of adding lemon! I’m sure our customers today will appreciate the new addition! Wonderful! I hope you – and your customers – like them! 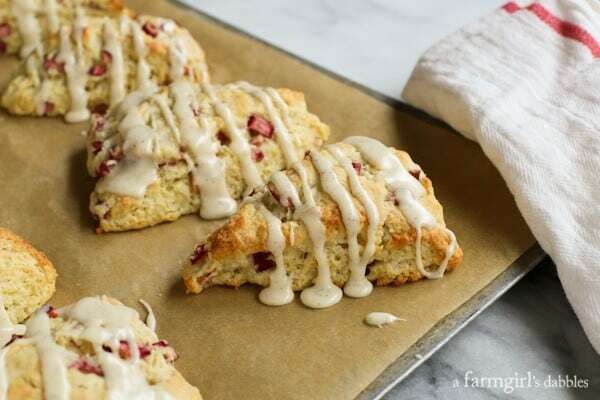 We are big fans of rhubarb in this house, so I know these scones would be devoured in minutes! I’d like to snack on one, with one of your rhubarb mojitos on the side. Rhubarb is growing like crazy around here lately – these look perfect!!! And you know I love the lemon! Oh I so want one of these now! They look amazing! I’ve never had rhubarb in a scone. What a delicious idea. It’s been a many months since I’ve made scones, which, seeing how obsessed I am with them, is kind of amazing (and very very sad). These look so wonderful and it’s so nice seeing someone use rhubarb… I feel like it scares people, but it’s so good and tangy! I’m so jealous! These look amazing and I can’t find rhubarb anywhere near me!